The interview of the people that realized Street Dreams is scheduled to air on FUEL TV on July 3. Street Dreams, the feature-length film about teen skateboarders with dreams of one day being sponsored, opened at Grauman’s Chinese Theater in Los Angeles this month and the ChopShop crew was in Hollywood to shoot a Blue Carpet Special for FUEL TV. In FUEL TV’s programming parlance ‘Blue Carpet’ is their movie premiere interview show. 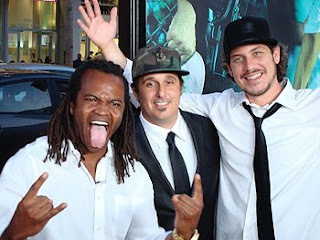 Celebrities from the skateboard world were all present from the stars of the film to Director Chris Zamoscianyk, Executive Producers Rob Dydrek, Sal Masekela and Jason Bergh. In addition to being one of the film’s Executive Producers, pro skateboarder Rob Dydrek wrote the screenplay for the film and had a starring role. Street Dreams’ stars Paul “P Rod” Rodriguez, Ryan Dunn, Terry Kennedy, and Adam Wily were interviewed at the Hollywood Roosevelt Hotel by FUEL TV hosts Pat Parnell and Tina Dixon along with the other stars, director and producers. ChopShop Creative Director Zach Lyons, Producer Sean Osborne along with their crew were at the theater and the Hollywood Roosevelt Hotel where the interviews were conducted. After producing and shooting the interviews and the opening festivities, ChopShop edited the footage for the half-hour Blue Carpet Special that is scheduled to air on FUEL TV on July 3. Set mainly in Chicago, Illinois Street Dreams follows the teens to a Tampa, Florida contest and through the trials they endure with parents, teachers, girlfriends and even a brush with the law to reach their goal of finding sponsors. Street Dreams is now being shown at selected theaters across the country and is gaining box office popularity. What did you do on skateboarder's day? What did you do on skateboarding day?